Acclaimed historian Rick Perlstein chronicles the rise of the conservative movement in the liberal 1960s. 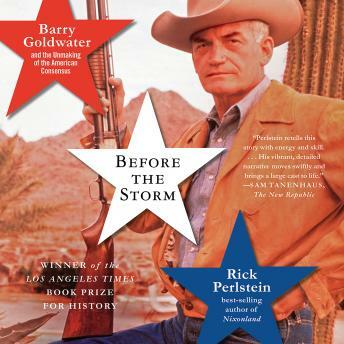 At the heart of the story is Barry Goldwater, the renegade Republican from Arizona who loathed federal government, despised liberals, and mocked peaceful coexistence” with the USSR. Perlstein's narrative shines a light on a whole world of conservatives and their antagonists, including William F. Buckley, Nelson Rockefeller, and Bill Moyers. Vividly written, Before the Storm is an essential book about the 1960s.